LinkStation 400 – How to Use USB Devices Connected to the LinkStation with Multiple Computers - Details of an answer | Buffalo Inc.
USB Device Server lets you use USB devices connected to the LinkStation with multiple computers. 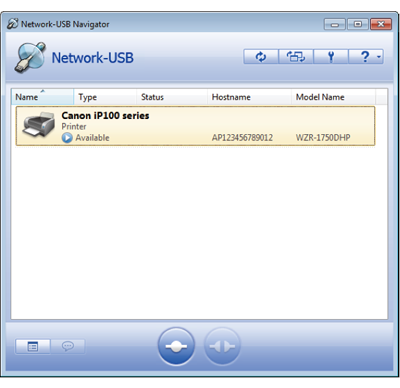 Install the driver and software by connecting the USB device to the computer. Remove the USB device after installation is completed. Connect the USB devices to the LinkStation's USB port. Note: With USB Device Server enabled, you may connect a single USB hub to the LinkStation. Up to 15 USB devices may be connected to the hub. Don't connect more than on bus-powered drive at a time. Use a separate AC power connection for each device if possible. Connecting more than one bus-powered device at a time may damage both the LinkStation and the devices. In Settings, move the USB Device Server switch to the position to enable USB Device Server. Note: When the USB Device Server is enabled, other functions that use the USB port won't be available. To install Network-USB Navigator, click [USB Device Server] in Easy Admin or navigate to [Services] - [USB Device Server] - [USB Device Server] in Settings. You'll need administrator privileges to install the software. Navigate to [(All) Programs] – [BUFFALO] – [Network-USB Server], then click [Network-USB Navigator]. On Windows 8, click [Network-USB Navigator] from the start screen. Navigate to [Macintosh HD] – [Applications] – [BUFFALO] – [Device Server] – [Network-USB Navigator]. Select the USB device, then click the button to connect. The selected USB device will install automatically. Refer to the help by clicking the button for more details about the software. Note: Only one computer can access the USB device at a time. 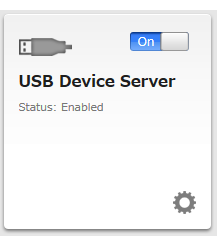 Select the USB device, then click the icon to disconnect. Make sure that no one else is using the USB device before disconnecting it.